A lot of the life on our planet is very, very small. Most of our planet is made up of water. These two ideas are easily memorized, but not as easily grasped. Life in One Cubic Foot at the National Museum of Natural History looks at where these two facts intersect. Scientists placed biocubes, cubes measuring one-foot by one-foot by one-foot, in the ocean and studied all the life that swam, floated, or swished through it for one day. And the amount of life in just that one cubic foot is staggering. Even more mind-blowing? All of those critters play a role in maintaining the oceans, and therefore our planet. That’s right, these tiny things maintain the planet. By studying these creatures, scientists can learn about the ocean’s biodiversity and how ecosystems work. Obviously, this is important, as is sharing this information with the public. But how can we do that? It’s easy enough to gather a few dozen people around an elephant – but how do we huddle around something not quite the size of a sea-monkey? We make a scale model of it. The idea of a scale model often conjures up ideas of miniatures – like cars or ships. In order to make those things easier to understand, model makers scale them down. The reverse also works: model makers can scale things up. 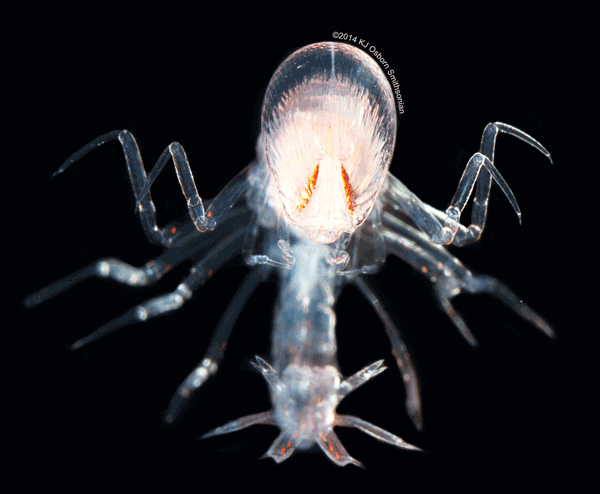 In the case of the Paraphronima gracilis, a creature so uncommon that it only has a Latin name, that meant creating a 13-inch sculpture of a creature that in reality, is smaller than a dime. Paraphronima gracilis is not much bigger than an M&M. It is not a facehugger from Alien. Smithsonian Exhibits model maker Carolyn Thome took on the challenge of making a realistic model of this diminutive crustacean. 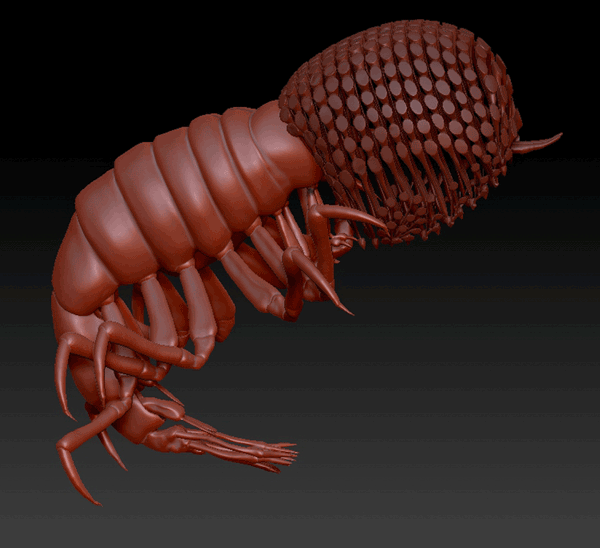 Working with photographs and drawings by NMNH research zoologist Karen Osborn, Carolyn created a model Paraphronima gracilis using the digital sculpting program zbrush. Carolyn met with Karen throughout the process to ensure accuracy and to fine-tune the digital sculpture before 3D printing the file. The digital version of our tiny friend – this offers a preview of what will be 3D printed. To ensure a successful 3D print, Carolyn organized the model into three sections: the outer eye, the inner eye, and the body and legs. Our in-house 3D printer only prints in an opaque material, and Paraphronima gracilis is translucent. Carolyn had an outside company that could print in a clear polymer print her digital sculpture. The three sections were printed separately and then Carolyn sanded them. And sanded them. And then sanded them some more. This reduced the build lines and made the model as smooth and polished as possible. She then fit the sections together and bound it with adhesive to create the final model. Once it was assembled, she sprayed a few coats of two-part automotive urethane clear coat to enhance the translucency and protect the model from UV rays. 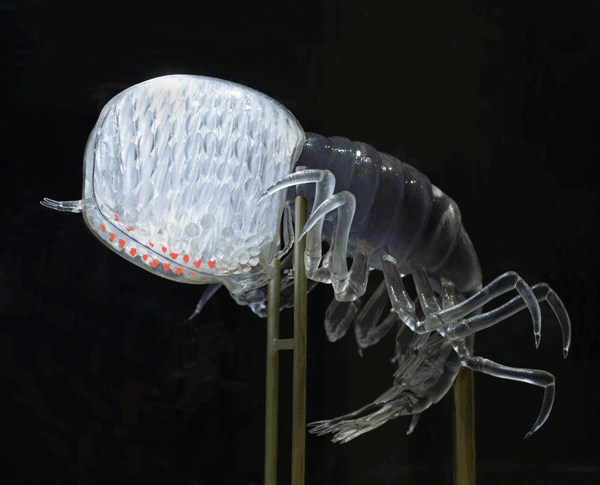 The final lifelike model – in real life Paraphronima gracilis is translucent, except for its 32 orange retinas. You can visit our transparent friend in the focus gallery of the Sant Ocean Hall on the first floor of the National Museum of Natural History.